So you're looking for information on Monopod heads, specifically which is the best monopod for your situation. First of all, let's get one thing straight. Monopod and tripod heads are essentially the same in at least one way. They support your camera and lens and both give you flexibility in changing the angle between the camera and the monopod or tripod legs. Some are more suitable for monopods and some are better for use with tripods, but it's not a big enough difference for most photographers that they're going to go out and get 2 monopod heads, one for their tripod and one for their monopod. Tilt-only heads are better suited to monopods, but we'll get to that more in a minute. Let's dive in. There are 5 types of heads for your monopods, each with different advantages and disadvantages. This post will help you figure out which is the best type of monopod head for your situation. Ball heads are by far the most popular and most widely used type of head for monopods when shooting still photos. 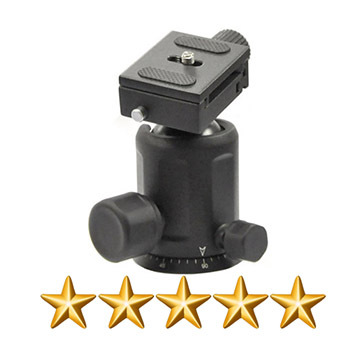 Fluid heads are more popular for shooting video. A ball head is made up of a ball and socket that allow rotation in all directions. Generally smaller and lighter than tilt heads, they use small knobs to tighten the left-right turning and rotational camera movements. I linked to a video below showing the camera movements you gain by adding a ball head to your monopod or tripod. This video was made in 2007 so it's severely outdated, but worth watching. The gentleman in the video was endorsing, at that time, a very well made high-end monopod great for the serious amateur or professional photographer. There is a huge range of ball heads ranging from the one featured in the video for a few hundred dollars to the cheap mini ball heads for point and shoot cameras for less than $20. I really like using a small ball head on my monopod because it keeps the whole set-up very light in weight. I also like using a small ball head on my Rocketfish carbon fiber tripod when doing travel photography, again because of the weight and size advantages of packing and carrying. 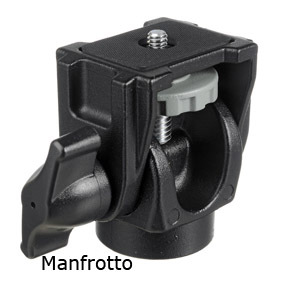 For use on my larger Bogen-Manfrotto tripod, I wouldn't want to be without my Manfrotto 222 Action ball Head, sold in the US as the Bogen 3265. 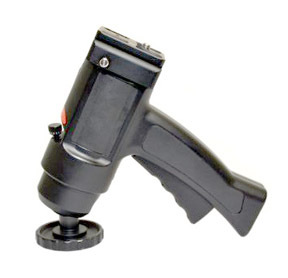 The pistol grip ball head is just a variation of the traditional ball head. It gives you a large handle to grab instead of the small knob of a traditional ball head. This head makes no sense at all to use with your monopod. This Opteka pistol grip has a side handle that simply squeezes to loosen the camera position and tightens upon your release after you've made your adjustment. 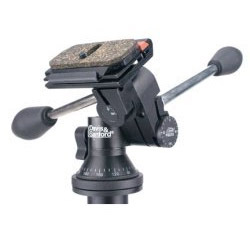 I always used a pistol grip ball head when shooting with my tripod, without exception for over 20 years. It is the fastest mechanism to make minor adjustments when shooting. I prefer the upright grip, which is centered underneath of my camera. This makes it quite easy to pick up and move my tripod by using only one hand. Tilt and pan heads are never used on tradition monopods. I have seen some photographers use pan/tilt heads for monopods when they have the feet attached, primarily while shooting videos. The disadvantage is that you have to the adjustments of left-right, forward-back and clockwise-counter-clockwise separately. In photography school most of the heads we used had screw driver handles both for rotating, panning and tilting our cameras. They are more appropriate to use when your camera and subject are going to remain stationary while shooting your video or photography. The Manfrotto swivel and tilt head on the left is very stable for the heavier loads associated with bigger cameras and lenses. 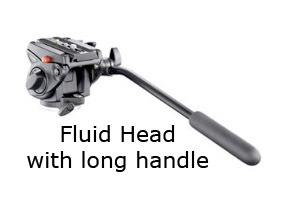 Fluid heads with one long handle are popular for video photographers. They make it easier to make small gradual movements of your video camera. 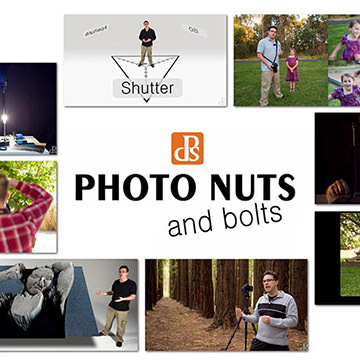 They are the single most popular head for shooting video with your monopod or tripod. Tilting heads make the most sense if you are looking for a head specifically for your monopod. I have a confession to make. I've never used a tilt-only head. I used fluid pan and tilt heads for about 30 years with a variety of tripods, usually when I was doing still life or nature photography. This video does a real good job of explaining why discriminating photographers like you would rather use a tilt-only head on their monopod. Some photographers disagree and this debate on ball head vs. tilt head has stirred up a few spirited discussions in some of the forums on the internet. I call this accessory the Double Bubble Camera Level. Say that as fast as you can 10 times. 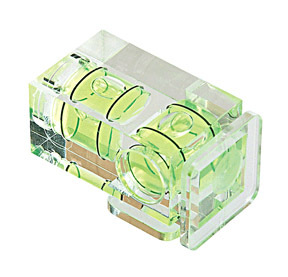 This is a great accessory for a monopod or tripod when you want to make sure your camera is level. It's a must for architectural photographers to get level photographs as well a when you are shooting panoramic photos. It could also be useful if you’re shooting with a horizon in your photo such as with beach photography and landscapes. 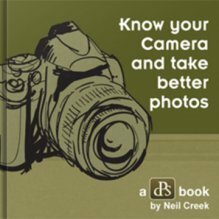 That saves you from spending extra time retouching your photos and having to adjust the horizon when cropping and tilting your image afterwards. I've been a shooting pro photographer for over 30 years and I still get a kick out of surprises in the world of photography. I get new ideas for photos to take as well as how a new piece of photography gear or an accessory will make my job easier. 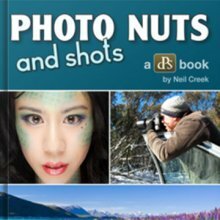 I know, for many of you this may seem to be no big deal, but I am frequently inspired when I come across a new photography niche or new piece of specialized equipment.